I guess this is why they actually play the games, eh? Caja Laboral Baskonia leapt out to a 12-0 lead behind the dominant play of Tiago Splitter to start game one of the ACB championship finals and hung on for the 63-58 win. The achievement of Baskonia’s win is reflected in historical statistics: Barcelona has not lost a home game to an ACB opponent since January 2009 to then-Tau Ceramica. The 58 points scored represents Barça’s lowest output in 2009-10; in fact, Barça’s only other sub-60 point game this season was its first loss, the 60-59 stunner at Valencia this January. Most damning of all may be this stat: In the last 26 ACB championships, the team that takes game one has won 24. After the 12-0 lead became 18-4, Xavi Pascual went to his bench to bring out Gianluca Basile, Pete Mickeal and Jaka Lakovic in an attempt to stop the wrecking crew of Splitter (who finished with 16 points and six rebounds), Marcelinho Huertas (11 points, eight rebounds) and the reawakened Mirza Teletović (11 points, six rebounds). The ploy worked temporarily as Basile lead the way on a 9-0 run to make it 18-13. Particularly good was Basile, substituted for the clearly nervy Ricky Rubio early on, who nailed a pair of long threes to get the Blaugrana within six. Terence Morris slammed home a jam to make it 22-18 a bit later. But just as it seemed the momentum had permanently shifted, Splitter went back to work on pick-and-roll after pick-and-roll, putting Baskonia again up by 12. But again, Barça would not be kept down. The combination of Rubio, Mickeal and Juan Carlos Navarro – with just minutes left in the first 20, this three had managed a combined player ranking of minus-5 – were responsible for all assists and all points in a 10-0 run that gave Baskonia a mere two-point lead, 34-32, heading into halftime. And in fact, when Navarro hit a sweet three shortly after half, Barça had their first lead of the game at 37-36. Barcelona returned to their deadly defensive ways in the third, clamping down on Splitter and the rest, particularly thanks to the dominant presence of Boniface N’Dong down low. When all of a sudden it became Lakers-Celtics game two out there. A back-and-forth battle in Barcelona inexplicably became all Baskonia in the last four minutes of the game. Then 56-56, Baskonia got a basket from Brad Oleson (Brad Oleson!) 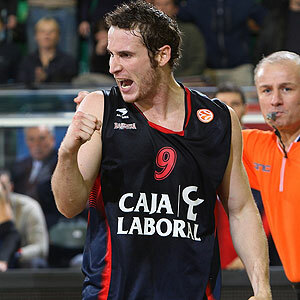 and a dagger three from Huertas. Some folks are saying that the 2009-10 FC Barcelona squad is the greatest European club of the last 10 years – heck, BallinEurope almost did – and possibly of all-time. Tell you what, though: This club is going to have to look a lot better closing out games against hungry competition in order to earn the rep of an all-time great. Game two of the ACB championship series tips off on Saturday, June 12, at 6pm CET (noon EST). Watch out, the girls are coming! I think Duke’s championship team could hang with both of these teams. Anyone that says this year’s Barcelona is the best European team of the decade or of all time has obviously only been following European basketball for a VERY short time. @ Michael: Wellllllllll, i haven’t followed European basketball all my life, but i’ve been into it now for 11 years (yikes). I blame part of the hype from these quarters on my American nature: In sports, the last champion’s always the greatest, etc. But don’t you think (if, say, they win the next three games handily) that 2009-10 Barcelona at least deserves to be in the discussion? At this point, Kukoc’s old Split teams plus the Maccabi and CSKA teams from the middle of the decade are the first teams i think of when listing the greatest recent European teams … but you gotta admit Barca’s got tons of talent and has looked very good very often in 2009-10. What’s your opinion on the greatest…? Season record 60-8, winner Championship , national cup & euroleague. In my opinion Barça has plenty of talent… but miss a ‘G’reat coach.. Why don’t we talk of the 5 that ended gm1?? Lakovic on court?? Anyone among basile, sada could stop huertas much more better. Why Lorbek has been benched for Ndong? @Tray… some doubt about that…. Barca is not the best Euroepan team ever and not even of the last 10 years as is implied here. Seriously, in the last decade there were CSKA, PAO, and Maccabi teams that were all better. Barca is starting to get extremely overrated now. I honestly don’t think they could even beat teams like this year’s CSKA and PAO in a series. Maybe the ACB Finals is exposing them a bit. They won so far in Spanish Cup and Euroleague where they did not have to play series. They beat Real in a series when their whole club was in total dissaray. They eliminated PAO in Top 16 when that club was riddled with players that were playing with injuries. They did beat CSKA but that’s a watered down version of past CSKA teams and even then they would struggle against that team in a series. They beat Olympiacos which is also a very overrated team and would not beat any top team in a long series, which if you do not believe you can check the results of the Greek Finals against PAO. Barcelona is definitely not one of the best teams ever or even in recent years. They are a very good team for sure, but let’s not get carried away here. 2006-2009 PAO and CSKA teams would have easily beaten them.